The Vivo 1818 model number along with its Vivo V15 Pro product name has been approved by Thailand’s NBTC authority. Vivo India has recently confirmed that it will be holding a launch event on February 20. Vivo India has not mentioned the name of the device it will be launching on the said date. However, the launch poster released by the company carries an image of a phone with pop-up selfie camera which indicates it will be launching the Vivo V15 Pro in India. The NBTC approval indicates that other Asian countries including Thailand will be receiving the Vivo V15 Pro smartphone. 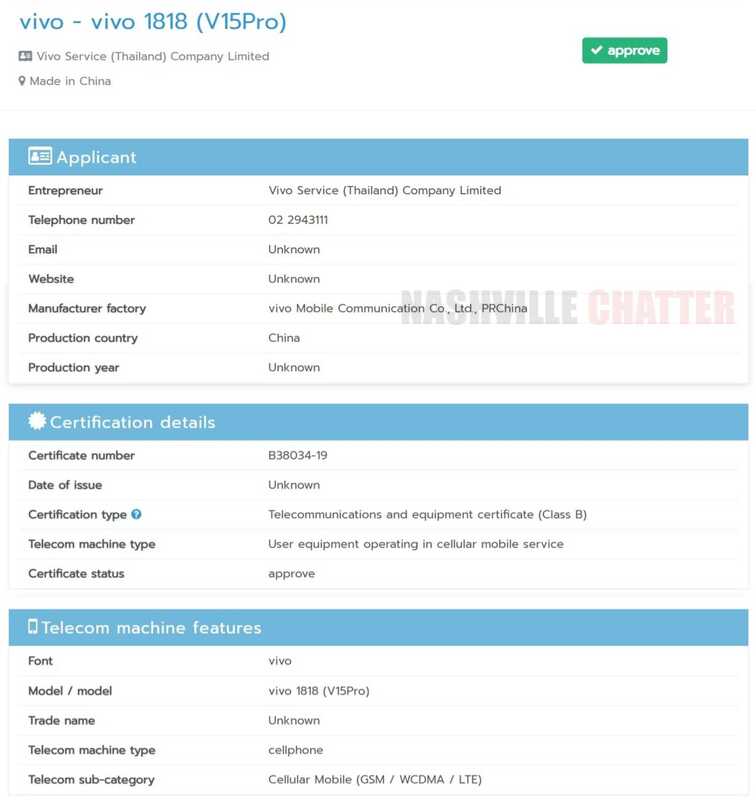 The NBTC approval of the Vivo 1818 carries no information on its specifications. In December, the very same model was approved by the Eurasian Economic Commission (EEC) which indicates that the Vivo V15 Pro will be also heading to Europe. Recent reports have revealed that India will be receiving both Vivo V15 and Vivo 15 Pro handsets. Both smartphones are speculated to come equipped with in-display fingerprint scanner. The V15 Pro will feature a pop-up selfie camera, but there is no confirmation on whether the Vivo V15 model will also have it. Also, the Vivo V15 Pro is expected to feature a triple camera setup with 32-megapixel as the primary sensor. Probably, the Vivo V15 could be equipped with a dual camera, but it is also expected to feature a main sensor of 32-megapixel. The Vivo V15 could be priced between INR 20,000 ($280) to INR 25,000 ($350) and the V15 Pro may cost between INR 25,000 ($350) and INR 30,000 ($420) in India. Rumors have it that the Vivo V15 Pro will be also debuting in China. However, instead of the V15 Pro moniker, it may hit the Chinese market as Vivo X25.